As a video productions teacher, I realized that the most important grade a student can receive on a project wasn’t from me but from a client. One of my favorite assignments was to have the students find someone in the community that needed an ad or a story to be told, do the research, conduct the interviews then (before moving it to VHS, then to DVD, then to YouTube and their phones), they had to sit down with the folks involved and get the green-light–even if it was grandpa recalling his wedding day. Photography of Detroit and its people. Friday was an amazing day for the Media Teacher Symposium sponsored by DAFT (Digital Arts, Film and Television–the sponsor of the 47-year Michigan Student Film Festival at the DIA’s Detroit Film Theatre on April 25 free and open to the public). The common theme that was heard throughout the day from teachers and pros was the importance of allowing students to keep writing, keep filming, keep taking pictures. We had a chance to offer our website as a forum to the 50 attending video production teachers, school administrators and media professionals–some from as far away as Holland, Michigan and St. Louis, Missouri! Media professionals at DAFT’s Feb. 27th Media Teacher Symposium–including Michael Kuentz (far left), DD’s contributing blogger–along with Ric Viers, Harry Akers, Nicole LaDouceur, Kale Davidoff and Aaron Lebovic. 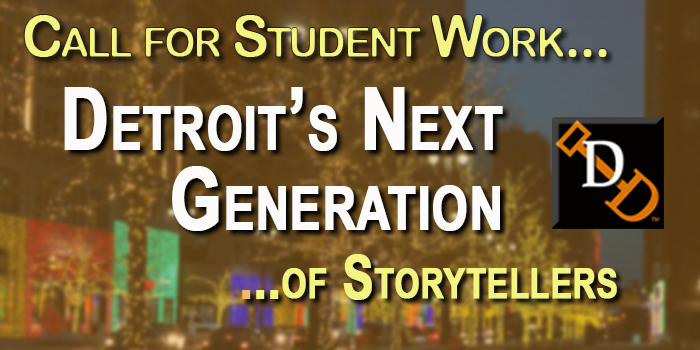 If you are a student, educator, parent or fan of helping us foster these young storytellers, please follow this link and complete the form! We’ll be happy to provide guidance and even come visit your school to help brainstorm some projects! Help us to promote student enthusiasm and and their continued efforts to improve their craft–all while gathering vital links to our past. And that’s sure more important than just a grade in book, isn’t it? Posted in Detroit History, Education, Episodes, Podcasts, Student Productions and tagged Digging Detroit, Student Productions, Students.